Renowned City University London alumnus Daniel Finklestein is to become a Conservative peer in the House of Lords. The associate editor of The Times is one of thirty new appointments selected following nominations from the political party leaders. 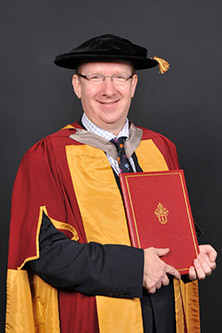 A graduate of City's MSc in Business Systems Analysis and Design, Daniel also holds an Honorary Doctorate from the University which was awarded during 2011 in recognition of his contributions to electronic publishing. Daniel's distinguished career has included being Editor of Connexion, Britain's first internet and data communications newspaper, directing the Social Market Foundation think tank and holding the position of Head of Policy for the Conservative Party. He currently writes for The Times and the Jewish Chronicle, where he also holds a seat on the publications Board. "Daniel is a prominent alumnus and enthusiastic supporter of City. His achievements bring great credit to the University and we are immensely proud to have another alumnus and close friend in the Upper House." Daniel's father was Emeritus Professor Ludwik Finkelstein OBE, one of City's longest-serving members of academic staff. Professor Finkelstein joined City's predecessor, the Northampton College of Advanced Technology, in 1959. He retired from full-time employment in 1993 but maintained strong links with the University until his death in 2011.